NEW YORK, March 14, 2018-In recent months, the crisis in the Central African Republic (CAR) that erupted five years ago has seemed farther than ever from resolution. In 2017, episodes of extreme identity-based violence brought the toll of displaced people in and from CAR recently to over a million people. The peace agenda stemming from the 2015 Bangui Forum has remained stalled, with national and international authorities forced to ramp up peace-keeping efforts to address the resurgence in violence. A new report by ICTJ, I Am 100% Central African: Identity and Inclusion in the Experience of Central African Muslim Refugees in Chad and Cameroon, offers important insights on how a higher political commitment to inclusion could help transform a volatile rebuilding process into a sustainable peace. As ICTJ's report highlights, the voices of Muslim and Peuhl refugees from CAR living in Chad and Cameroon have largely been ignored in the peace process. The displaced, many of whose families had lived in CAR for generations, expressed a sense of alienation and frustration. "We used to eat together but one day they woke up and they told me: 'You are a foreigner, you have to leave.' Do you understand what I mean?" said a 33-year-old man from Bangui who was interviewed for the study. The current crisis in CAR follows years of political instability and state fragility, whose underlying causes included deep-seated ethnic tensions and longstanding disputes about who is considered Central African. The diffuse and horrific violence among communities, neighbors, and members of the same family led to a deep tearing of its social fabric, unprecedented human rights violations, and growing social and economic exclusion. The ICTJ study - carried out through qualitative interviews with refugees about their experience of displacement and their concerns regarding return, reconciliation, and justice - aims to draw attention to the need for inclusion to advance effective reconciliation and return policies, said the author, Enrica Picco. It found that a lack of inclusion is the crucial underlying issue for refugees, including concerns over access to state services and jobs closed to those not considered to be truly "Central African," due to their place of origin, ethnicity, or religion. "To date, the Central African government has said very little to combat hate-filled narratives regarding Muslim and Peuhl communities," said Picco. "These narratives, and the prejudice and hatred they engender, are preventing refugees from considering returning home." Highlighting the injustice and the state's responsibility and role in the violence, the report also reflected refugees' deep distrust of CAR's national justice system. Opinions varied widely on who should be investigated and how, but there was agreement that mainly former presidents and warlords should be put on trial. In a context of improved security, traditional chiefs could play a role, especially in resolving property and land disputes. Many persons also expressed a strong desire to be recompensed for the property and businesses unfairly taken from them. "A politics of inclusion and strong top-down messages affirming Muslim Central Africans are citizens with equal rights would help to put CAR on the path of peaceful coexistence," said Picco. 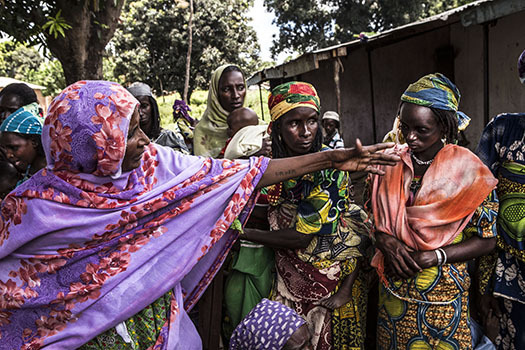 "In contexts such as the Central African Republic, where ongoing violence and displacement coincide with elements of a transition, it can be very challenging to address justice and reconciliation," said ICTJ's Senior Expert Roger Duthie. "In order for transitional justice to help prevent the recurrence of violations and facilitate sustainable peace and development, victims, including refugees, have to be able to meaningfully participate." Key recommendations from the report echoed the concerns of refugees hoping to return home and integrate into their communities. Read them below. Promote durable solutions in countries of asylum.